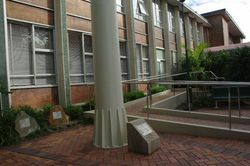 A plaque unveiled on Australia Day 2001 to mark the raising of the Australian flag to commemorate the centenary of Federation. 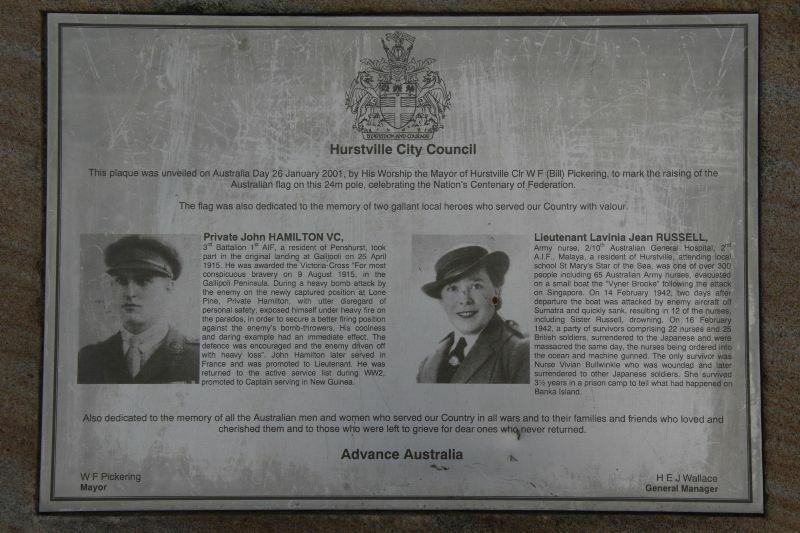 The flag raised on that day was dedicated to local heroes Private John Hamilton VC and Lieutenant Lavinia Russell and all Australian servicemen and women who have served in conflicts in which Australia has been involved. 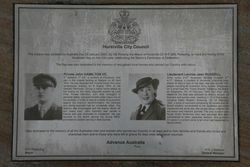 This plaque was unveiled on Australia Day 2001, by His Worship the Mayor of Hurstville Clr W F (Bill) Pickering to mark the raising of the Australian flag on the 24m pole, celebrating the Nation's Centenary of Federation. The flag was also dedicated in memory of two gallant local heroes who served our Country with valour. 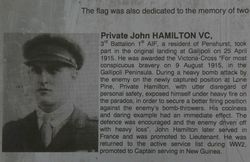 Private John HAMILTON VC , 3rd Battalion 1st A.I.F , a resident of Penshurst, took part in the original landing of Gallipoli on 25 April 1915. He was awarded the Victoria Cross "For most conspicuous bravery on 9 August 1915, in the Gallipoli Peninsula. During a heavy bomb attack on the newly captured position at Lone Pine, Private Hamilton with utter disregard of personal safety, exposed himself under heavy fire on the parados, in order to secure a better firing position against the enemy's bomb-throwers. His coolness and daring example had an immediate effect. The defence was encouraged and the enemy driven off with heavy loss". John Hamilton later served in France and was promoted to Lieutenant. he was returned to the active service list during WW2, promoted to captain serving in New Guinea. 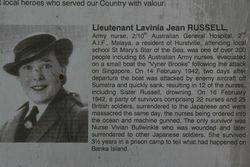 Lieutenant Lavinia Jean RUSSELL, Army nurse, 2/10th Australian General Hospital, 2nd A.I.F., Malaya, a resident of Hurstville, attending St Mary's Star of the Sea, was one of over 300 people including 65 Australian Army nurses, evacuated on a small boat the "Vyner Brook" following the attack on Singapore. On 14 February 1942, two days after the departure the boat was attacked by enemy aircraft off Sumatra and quickly sank, resulting in 12 of the nurses, including Sister Russell, drowning. On 16 February 1942, a party of survivors comprising 22 nurses and 25 British soldiers, surrendered to the Japanese and were massacred the same day, the nurses being ordered into the ocean and machine gunned. The only survivor was Nurse Vivian Bullwinkle who was wounded and later surrendered to other Japanese soldiers. She survived 3½ years in a prison camp to tell what had happened on Banka Island. Also dedicated to the memory of all the Australian men and women who served our Country in all wars and to their families and friends who loved and cherished them and to those who were left to grieve for dear ones who never returned.